Kay Snap Children's Card Game, made in England, 1930s. 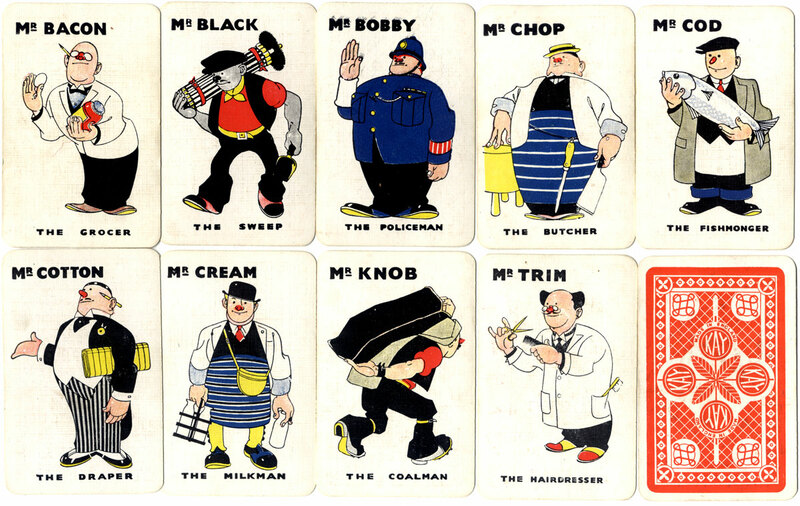 Nine sets of four identical cards showing common trades of the era, all male and wearing their traditional garb, including the Coalman, the Butcher, the Milkman, the Draper and the Policeman. No female workers are depicted and the tradesmen are all titled as Mr. With the exception of Mr Black, all the tradesmen have red noses. 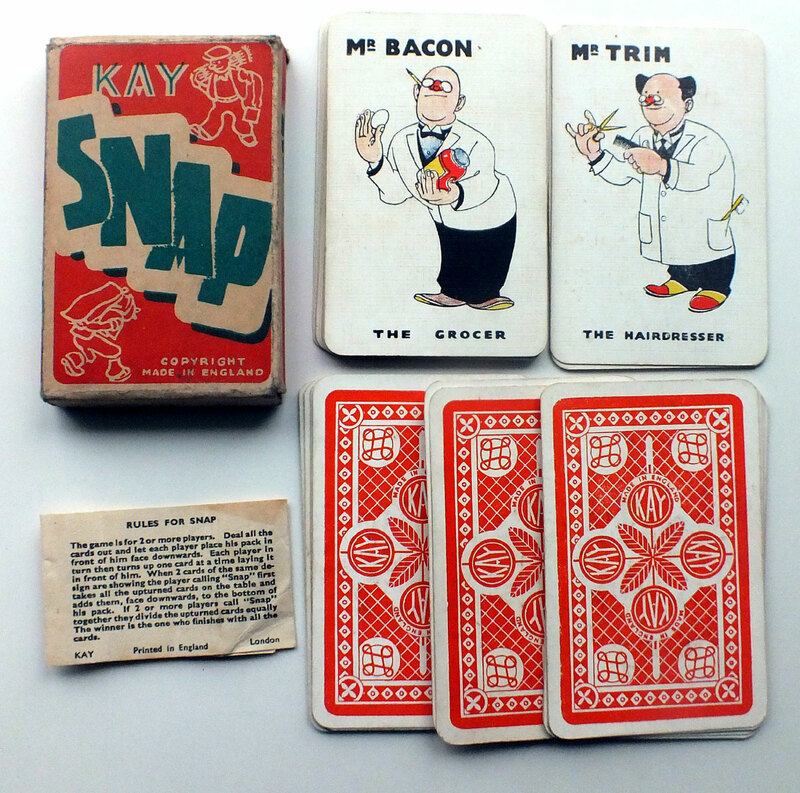 Right: the box from Kay Snap card game, showing two of the tradesmen from the game, made in England, 1930s. Following the difficult times of the Great Depression, it is curious that none of the new industries which employed women during the 1930s are depicted in this game for young children. However, the issue was still contentious, and the popular opinion may have prevailed that married women who brought a second wage into the household were denying others of their fair share. Above: nine cards and the reverse from Kay Snap card game, total number of cards = 36; made in England, 1930s. The titles, inscriptions and rules are set in Gill Sans typeface which first appeared in around 1928-29. 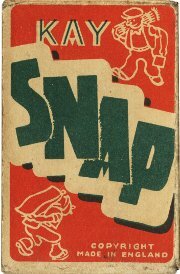 Right: the Rules leaflet from Kay Snap card game, made in England, 1930s. It can be seen that the rules are very simple and the object of the game is to win all the cards. 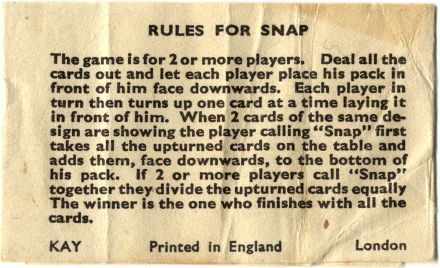 The game of Snap is often a child's first introduction to playing cards.